The Curious Case of Norway Where Every Citizen Is Now A Millionaire! Last week, something very interesting happened which will force Indian economists and planners to think hard where our country is going and where we plan to take our country in future. There are 5,096,300 citizens in Norway, and based on the current sovereign wealth fund which Norway has created, every citizen has theoretically become a millionaire. The sovereign wealth fund of Norway soared to 5.11 Trillion Crowns or $828.66 Billion, thanks to rising oil prices and gas prices. This has made each and every citizen of Norway a millionaire. In the year 1969, Norway found out oil in North Sea. Today, they are world’s 7th biggest oil exporter, Europe’s largest oil producer and world’s second largest natural gas exporter. The sovereign wealth fund was formed in the year 1990 to help the future generations of Norway to lead a respectable life. They have not spent the funds on creating statues and foreign trips for their politicians but, they have become entrepreneurs and invested that fund. Right now, this sovereign wealth fund of Norway holds 1% of world’s stocks, properties in all over the world, right from Boston, New York to London, Hong Kong and Dubai. They have even invested in India, China and Brazil and even if the oil production stops today, they will have enough money to keep the momentum going. This sovereign wealth fund of Norway is accumulated by collecting taxes from oil money, and they re-invest the funds in more investments, including real estate. The current value of this fund is 183% of Norway’s 2013 GDP; this makes every citizen of Norway worth $177,000! Such sovereign wealth funds is also maintained by several other oil rich countries such as UAE which has $800 billion in its kitty, Kuwait has $400 billion, Russia and Kazakhstan has $180 billion each. But leading this pack is Norway with $828.66 billion and raring to go from here. Its not that every citizen would be showered with a million crowns right now; Since 1990, when this fund was created, Norway has methodologically planned it’s expenditure. The government is allowed to use only 4% of this sovereign wealth fund in a year, making it a solid capital and war-chest of money to create more wealth. This sovereign wealth fund created by Norway is more like a fixed saving plan, with option of reinvesting in every sector. Though there are some controversies attached with this oil money as well, as economists are warning that depending solely on oil money is hazardous for the country’s economy. But none the less, at a time when most of European countries are reeling under huge debt and are seeking external help to stabilize their economies, Norway’s super success with managing their oil and the subsequent revenues is simply staggering. We hope that Indian politicians and economists learn something from this massive success of planning, saving and investing to come up with beneficial schemes for all Indians. 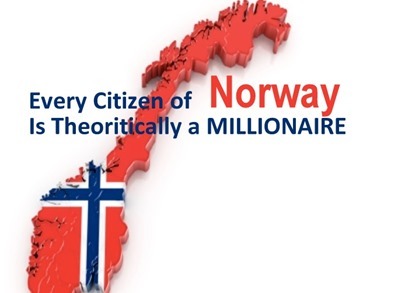 What are your views on this curious case of Norway, where every citizen is now a millionaire? Please share your views by commenting right here!